BAKERSFIELD, CA - Grimmway Farms welcomed United States Department of Agriculture Under Secretary for Marketing and Regulatory Programs Greg Ibach to its Arvin, CA, headquarters last week, highlighting Kern County and California agriculture. 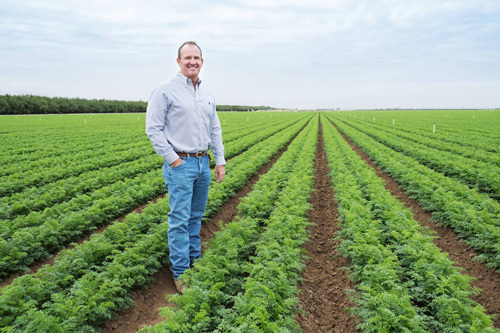 During the Under Secretary’s visit, company President Jeff Huckaby led a tour of the company’s local farmland and facilities, showcasing carrot processing technology and organic vegetable harvest operations. Grimmway Farms and California Department of Food and Agriculture Secretary Karen Ross also hosted the November meeting of the California State Board of Food and Agriculture during the Under Secretary’s visit. During the meeting, Under Secretary Ibach addressed the group on issues facing Grimmway Farms and the agriculture industry at the state and federal levels. According to a press release, the California State Board of Food and Agriculture acts as advisor to the governor and secretary, addressing key issues that are of importance to California’s farmers and ranchers, community stakeholders, and citizens. Board meetings—which are open to the public—occur monthly.